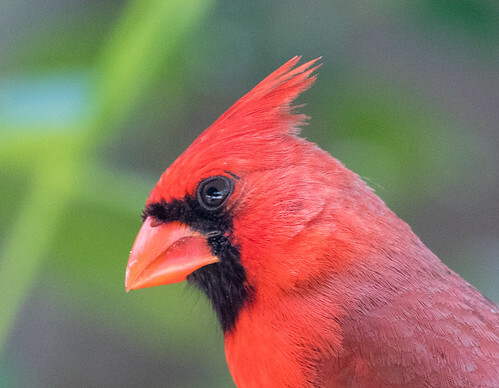 Hi, Laura: My name is Amelia and my favorite bird is a cardinal. 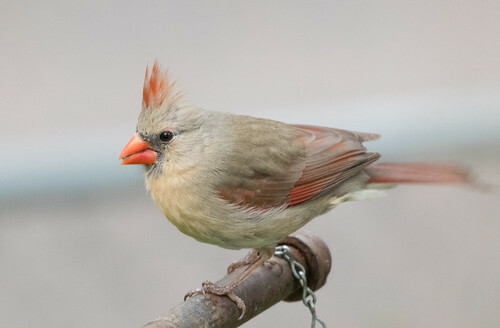 When my husband, Andy and I lived in Green Bay, Wisconsin, we had a large backyard and one year we had a brood of three boy cardinals and at least one girl. The boys would chase each other around the yard and house in a big loop. They were so much fun to watch. We also liked listening to them sing from our screened-in porch. We occasionally whistled back and a couple of times repeated their song incorrectly. As a new birder, I was wondering if they would ever learn the wrong song or if that was harmful to them in any way. I understand the pleasure to be had in whistling back and forth with a cardinal. My fondest memory of my own childhood was learning to whistle by imitating my neighborhood cardinals. One morning when I was in my bedroom whistling back and forth with a neighborhood cardinal, he flew in to a maple tree branch that pressed against my bedroom screen. His sparkling eyes meeting mine as he started a new song ignited my heart in a blaze of joy that still burns. I also understand Amelia’s worry that her whistling back and forth could somehow harm these baby cardinals in learning their own proper song. I wrote a whole book about the many ways we people hurt birds and how not to. When we learn how difficult it is for birds to negotiate this human-altered planet, those of us who love them can’t help but worry. But Amelia can let this particular worry go. As baby cardinals learn their song, they imitate one another and adults, but it’s the proper songs that they hear over and over that influence what their final song becomes. Our poor human imitations, even when they’re good enough to draw an adult cardinal in, can’t match the complexity of songs a real adult cardinal sings. The young birds will of course respond to our imitations, but what they learn comes from the real deal. And, oh, how he sings. In my mind’s play-center I hear his what cheer, cheer, cheer, his whistles as brilliant as he is handsome. The short what may slur briefly up, each cheer then taking most of a second to slur smoothly down the scale. What cheer, cheer, cheer, birdie-birdie-birdie follows, as he adds a little flourish on the end, then another what cheer, cheer, cheer. I hear other songs, too, of a clearly different pattern. Perhaps it’s pichew pichew tiw tiw tiw tiw tiw tiw tiw, over and over. I count them as he sings: 10, 15, 20 or so times and then it’s another song, perhaps a wooiit wooiit wooiit wooiit chew chew chew chew. All consist of pure whistles, some slurred up, some down; some are almost a second long and repeated slowly, others just a fraction of a second and delivered rapidly. It is fairly easy to hear the 8 to 10 different songs as he sings—he repeats each one enough times that I can get to know it, and then he goes on to another, each so different from the others. I soon hear his favored sequences, too, as I can often predict the next song based on his current song. Like many other songbirds, the males engage in community conversations. I’ve heard them here in the cemetery, the resident male and two of his neighbors hurling identical songs back and forth at one another, as their repertoires are much the same. In heated debates the songs become longer and more complex, with extra whistled phrases and perhaps even a red squirrel-like chirr added to the end of the song. In these vocal skirmishes they switch to new songs more frequently, too, and match each other more often than not, typically repeating each song just a few times before introducing another, as if the war will be won by who switches to a new song first, or by he who refuses to follow the leader, or in some other conversational convention that only cardinals know. Yes, I’ve heard them here in the cemetery, and elsewhere, too, on Cape Cod, and in almost every state down to Florida, west to Texas and north to Minnesota, as they play the same games everywhere. And she also sings. It is she who has brought me here, to know her and her singing role better. By March or April, perhaps a month after he’s been in full song, she chimes in, at least according to the expert accounts I have read. She sings far less than he does; it seems that her songs are not repeated as precisely as his, and they seem not to be as loud, either. She often sings from under cover, too, while the showy male is perched in the open. There’s nothing second-rate about her songs, though, as her repertoire is essentially identical to his. She sometimes uses her songs to defend her territory against an intruding female, but mostly she duets with her mate, and usually when they are rather close by. And when she duets with her mate, she almost always matches him, his pichew pichew tiw tiw tiw tiw tiw tiw tiw followed quickly by hers, his what cheer, cheer, cheer by hers. Listening to cardinals sing while trying to figure out which birds are doing the singing is richly rewarding, whether we whistle back or not. When I was in the Florida Everglades in April, I made the recording of cardinals that I used as a background sound on the podcast corresponding to this transcript; the recording of a male/female duet was taken from the CD included in Don Kroodsma’s book, The Singing Life of Birds, a book that is very much worth reading AND worth listening to.